This all began with me doing a spin class with Richard and Mike when they were training for LEJOG. I didn’t have a road bike then, I only had a couple of mountain bikes and no interest in road cycling, let alone buying a road bike. I was more interested in running half marathons & 10k’s!! That was until my ankles gave out. Then the road bike became an interest. 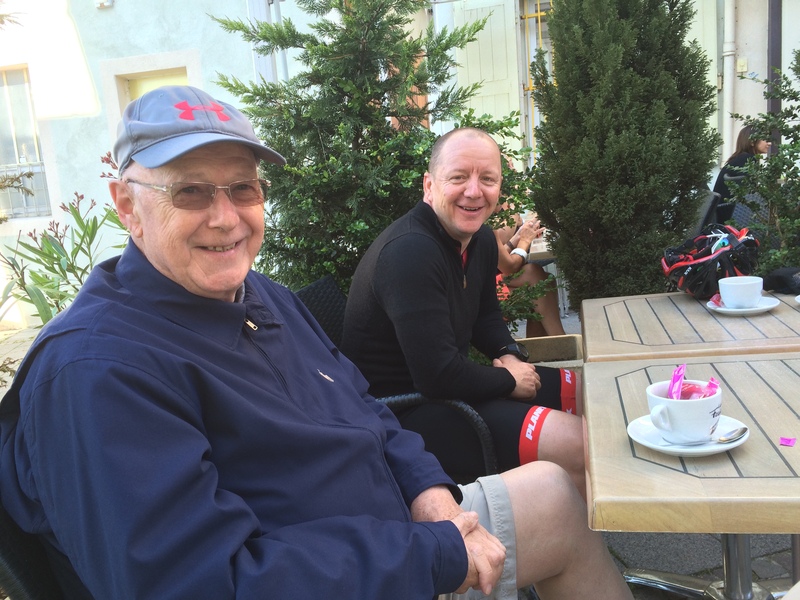 When I wandered into a bike shop and came out with my first road bike in May 2014… I then contacted Richard and Mike and went out on an evening ride, meeting Gary for the first time. I remember attempting to climb Hope mountain with the boys and saying to Mike, how do you get up there so easy …. But the seed was sown…. 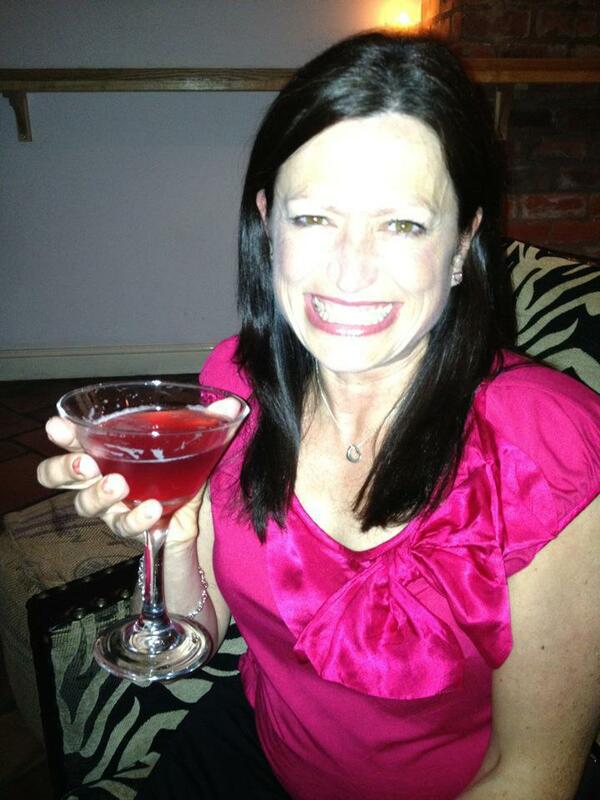 Look what you have encouraged me to do Mike!!! What monster have you created? 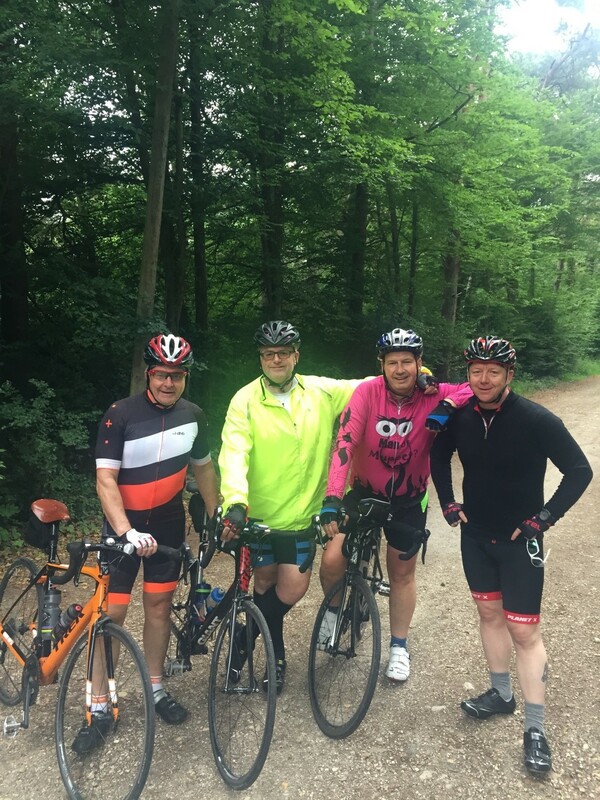 I must say that when I looked at all the guys cycling on this trip I did wonder how we would get on together, as we are all managers and directors in our own fields of work.. But we did, we pressed on together and gelled very well, supported by two guys who did a sterling job. Our first day was 108 miles to Gloucester and I’ve never ridden past 90 miles, so it was a first for me. Day one and I discovered my glasses had been crushed in the back of the mini bus and were beyond repair. This meant I had to use my sunglasses to read (they are prescription glasses ). Sat indoors trying to read and check my phone I earned various nicknames including Stevie Wonder and Roy Orbison ! On day 2 from Gloucester to the port 94 miles and now I am running on adrenaline. The end of day 2 sitting in the minibus waiting to board the late night ferry, I’m pooped and ready for my bed. Bed arrived in the form of a cabin to share with 3 other guys and I’m in the top bunk for just 3 hours when we are awoken and we are in France !!! We hit the road about 5 am with France fast asleep (the north of France appeared to be asleep for 2 days !!! ). 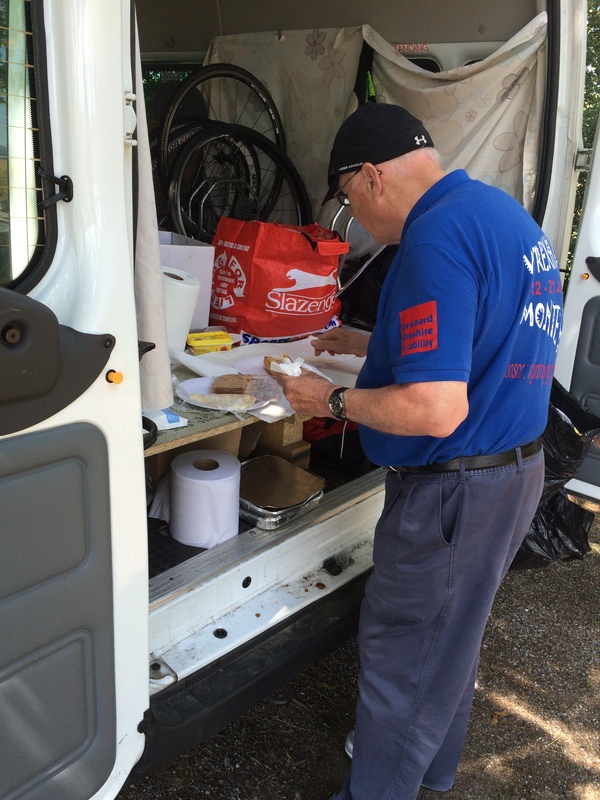 Our support crew were pulling their hair out looking for croissant and coffee – none to be found – France was closed and we ended up in a Turkish kebab house of all places…for our first lunch in France. 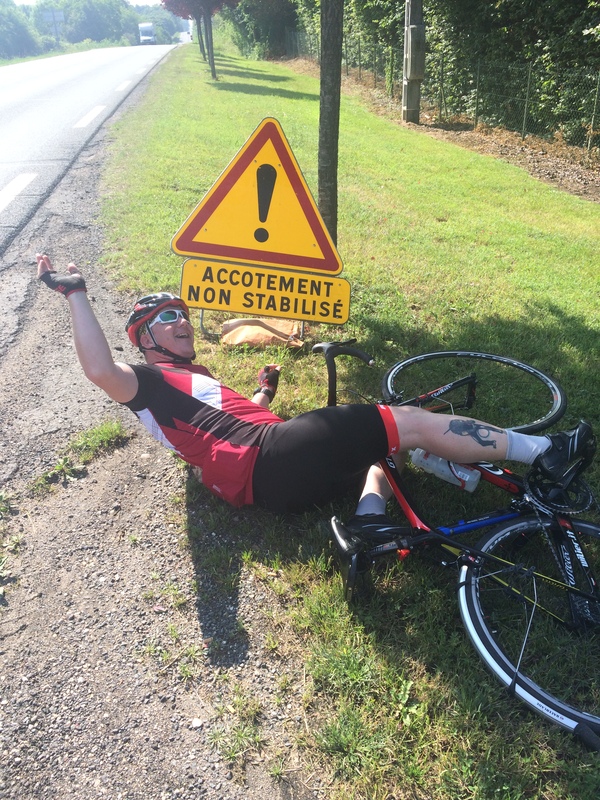 The next highlight for me was riding through France and arriving in the Central Massiff!!!! an understatement if ever… My dear me I couldn’t believe my eyes… We’ve got to climb that lot???? 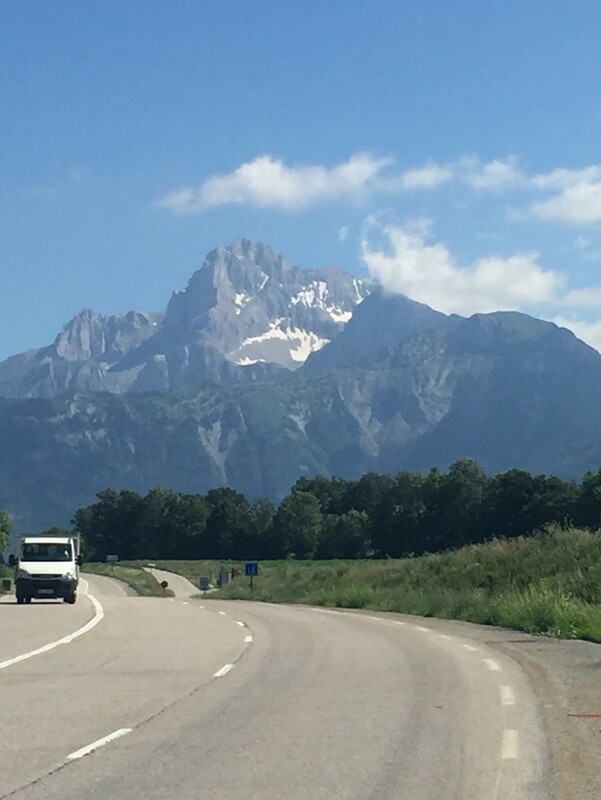 The Alps were very pretty, cycling through Grenoble was a sight to behold, but reality was about to hit….the first climb was breathtaking in more ways than one.. But we all made it to the top and the ride down was very welcome only to find, what comes down goes up and up, and up, and up. It was hard work but so rewarding..I tried to keep up with Gary and Steve but to no avail, but I gave it everything and when I reached the top I had to be lifted off my bike before I keeled over…I had nothing left in the tank. How was I going to carry on? I asked myself. But I had come away with some great advice from my dear wife about fuelling the body. I gave myself a few moments to recover and took my gels and drinks and hey presto I’m good to go. I had to remind myself to take a gel every hour and keep my body fed and watered as I rode. 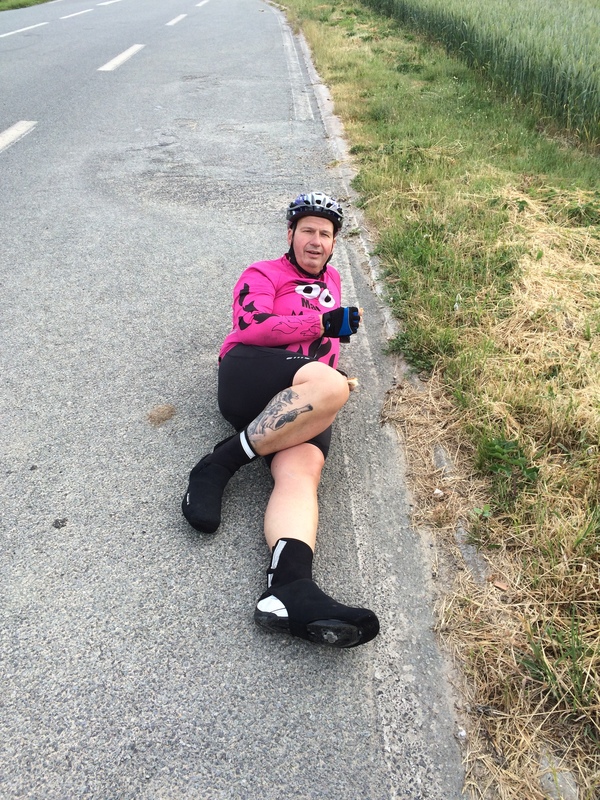 I did experience a full-on fatigue in my legs and had to have a tow off our support bus for five minutes, again this introduced more energy into my legs and I was good to go again. 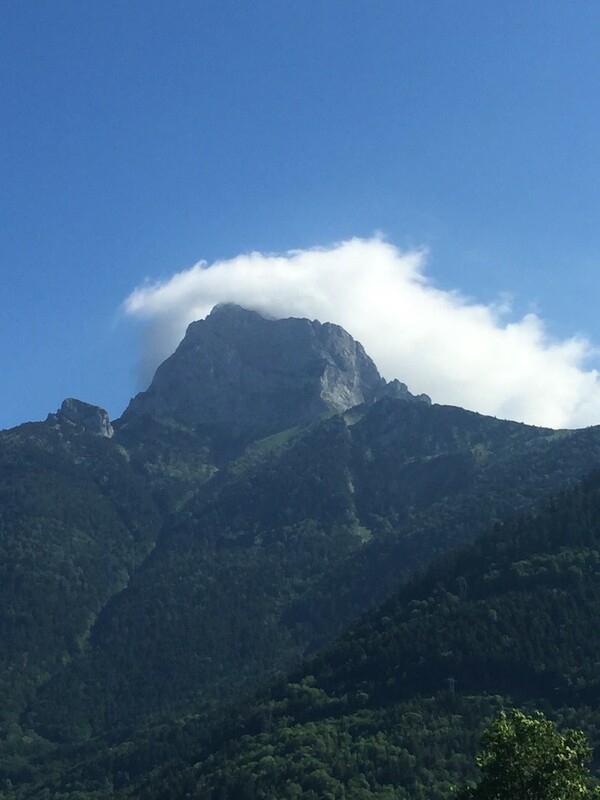 The climbs in the Alps were one after another or so it seemed I had to keep stopping to take pictures as the scenery was breathtaking and so was the incline… Our last day in the Alps was yet another new experience, a thunderstorm on the top of the mountain. By this time I was last man up the mountain and the heat was getting to me, so as I stopped to drink and rest a minute, so the boys got further away from my sight until I couldn’t see anyone ahead for miles and I was truly on my own, except for Bob and Barry keeping an eye on me in the minibus to make sure I was good to go and I didn’t need any help. Eventually I was caught up in the storm and this was my lowest moment of the trip until I spotted the minibus in a lay-by up the road. With the rain hammering down I stopped for a couple of Mars bars and a marathon bar. That did perk me up. Eventually I reached a roundabout and was busy looking for a signpost for Gap when I heard shouts of Allez, Allez, Allez and clapping. My buddy’s waiting for me with a coffee and it’s the end of our last day!!!! Our final day was an easy ride on the legs but a very emotional end to our trip.. We were all hugging and high 5s for our accomplishments. 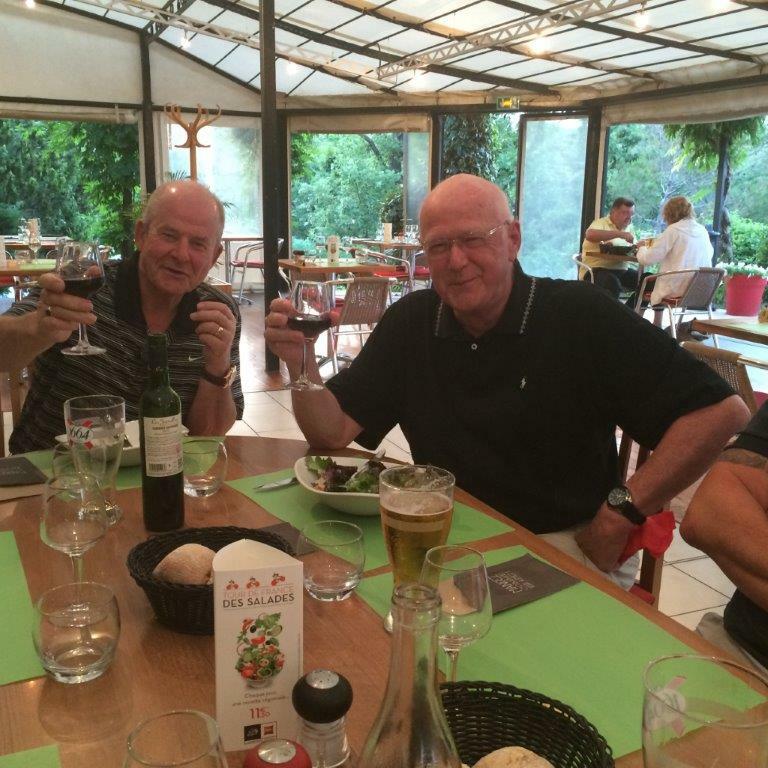 It was tremendous to finish and have a beer in Monte Carlo together. Then a quick ride over the border to Italy to get our 5 countries in.. So i find myself in Starbucks Rhostyllen, waiting for Richard, he’s going to run through the details with me. I ask my self, will I get the time off work, can I afford to go, can I do it, Richard arrives, large brew ordered and on with the details, it sounds fantastic, I’m in if I can get the time off work. Yes! the time is booked off work, that’s it I’m fully committed, text to Richard to confirm. Practice as much as possible, I’m lucky Llandegla mountain bike centre on my door step, shift work allows me to get out in the week. 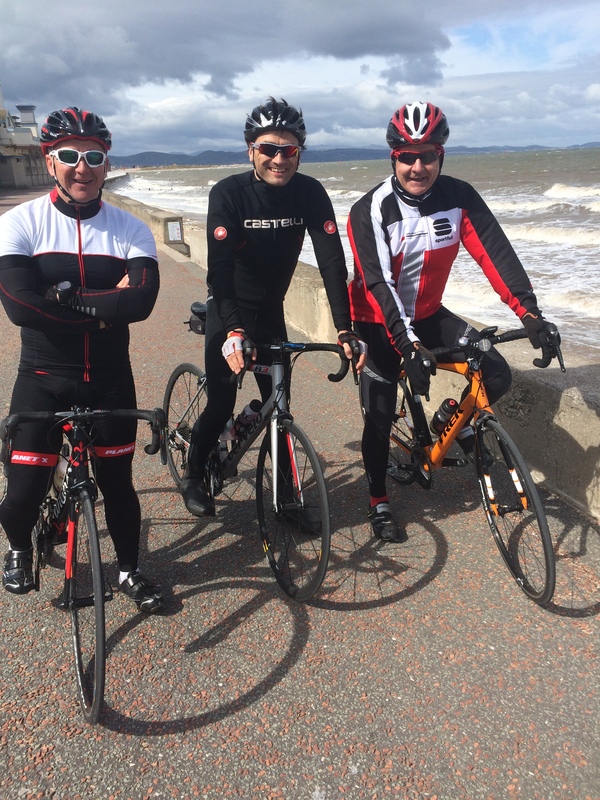 We meet at Richard’s office and meet the rest of the team, seem like a great bunch, we meet for regular practice rides around the Wrexham and Cheshire area. I start to look at kit, in particular the seat, I’m guessing long distance rides requires a good seat, a quick chat with a work colleague points me to the Brooks saddle, pure leather, no padding! surely that can’t be right, can it ? Being tight with money, I search the web for a deal, it takes a few weeks but I finally find a new one at the right price, its on the bike and I’m off, it’s hard but I’m finding it somewhat comfy, it looks rubbish on my bike though, I can’t decide do I keep it or sell it. I stick with it, so after approximately 500 miles of practice, I’m sold, no sore/stiff bottom, it’s a keeper, having done a charity ride the previous year on a mountain bike, i’m fully aware of the need for a good seat. Thursday 11th June 2015, the day before we leave, I’m lying in bed, have I packed everything? Am I going to be able to do it, have I taken on too much, It’s now 02.30 I cannot get off to sleep, 06.00 alarm wakes me, I’m very tired. Bike and bags loaded I’m heading into Wrexham to meet at Richard’s premises, the sun is shining, Derek the Weather man tweets we may get rain on the way down to the south coast, Guernsey is under water with heavy rain, I hope we miss it. Everyone arrives and after we say our good byes we are off, well Richard and Paul are literally, I’m sure it’s nerves. 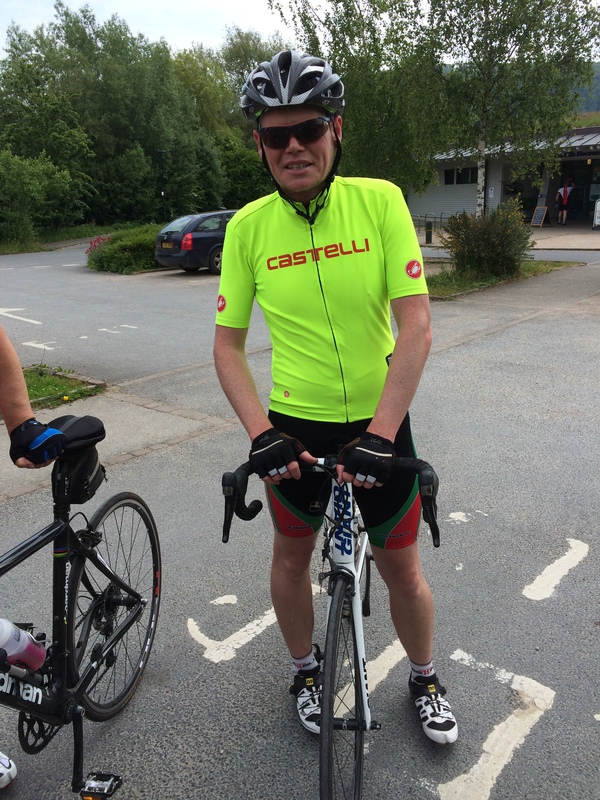 We head out of Wrexham and settle down to a good pace with Nick on the front and we make Shrewsbury in no time, I get to chat with everyone spirits are high, I have a feeling it’s going to be a great ride to Monte Carlo. 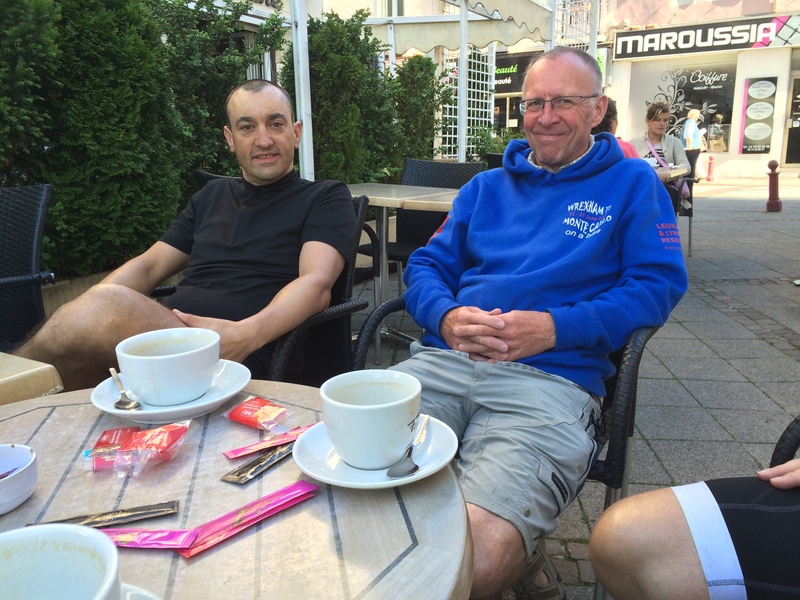 First food stop, a greasy spoon cafe close to Ludlow, a chance to speak with the support crew. Fed and watered we press on and get to our first overnight stop in Gloucester, what a great start to the day, out for an evening meal, the team is bonding well. Day 2 we pass through amazing country side, passing over the M4 , signs for London to our left, we are in the south of England, a long day but we finally reach the south coast, bikes packed and we are on the support vehicle heading for the Premier Inn to get washed and changed. We are in the cue for the ferry, it’s getting late, we board, bags out and we head for reception Mr Williams senior does a great job, rooms sorted everyone darts for bed, not even a look around the ferry, I’m disappointed, bed it is then. 04.00 alarm rings, crew outside banging the doors we are docking in Dieppe, it’s still dark, we get on the bus and disembark, as we get to customs, passports are handed over, the nice lady wants to see us all, Richard opens the door, she calls our names, the first comedy moment, Mike does a special wave, it’s that impressive she waves back in the same manner, we cheer and off we go, looking for somewhere to eat, it’s Sunday nowhere is open, the sun hasn’t risen yet. The support crew upfront look for a suitable stopping place, the routine is taking shape, bikes off suitable clothing on, water snacks and we are off, the sun rising to our right, it’s chilly but we’re not bothered. We admire the road surface, smooth, no pot holes to point at, this is great. First down hill, and its fast, big smiles all round, when you get a big down , you get a big up and it was but at least it warmed us up, we progress passing rows of turbines close to the road, rotating slowly, what a sight. We stop at a village, not a person in sight, no shops open, still no breakfast, no brew, i need a coffee, no Costa, I lie down on a bench, the support bus goes in search of food and drinks. We cycle on in hope of food and a coffee, please be coffee!!!!! Alas, it’s croissant but they are warm, lovely job done by the support crew, I look around, I can see rolling hills, wheat growing in the fields, I can see a single poppy amongst the wheat, photo opportunity , 35mm out and photos taken, reminds me of the war. I asked if we pass a cemetery can we stop, I get the nod. It was a great day riding in France, now for the hotel, IBIS I believe we are staying in, if we could just find the Tom Tom. So IBIS is located rooms dished out, I’m with Bob support crew, I feel we hit it off straight away, he sees my photo on my computer, I’m paragliding in Turkey, he knows it well, we chat for a while, i need to get my gadgets out, sync my ride, from my watch to Strava, my bed is like a teenagers, crap everywhere suitcase has exploded, I hope Bob doesn’t mind, he’s engrossed in a book, washing done, showered we meet for tea, its quick and we are off to bed, I am tired. 04.45 alarm call, no time to snooze that extra five mins, Oh I’d love that extra five mins. Barry leaves us today, on the bus to our start line, the ritual is sorted, we are like fine tuned athletes, well maybe not, we are off, it’s a day of climbs I can see at the top of every climb is a telecommunications mast, it can’t get any higher, look for the next one, it’s across the valley, they just keep appearing. My seat is great no soreness, it still looks crap on this carbon bike, the shame of it, least no one can see when i’m riding, my bottom approves. I take the front lead at times, but due to my speedometer being on my watch, I find myself out in front on my own, oops time to slow it down, I let the team pass, I’ll sit on the back and help on the climbs, I know some riders are carrying injuries, it can’t be easy, we are blessed by the weather gods or Derek the weather man, sun is out and sun cream is applied in vigorous amounts. Prior to leaving home, I had been playing with the idea of hair removal, on the legs, I’ve lost too much on the head already and so I went ahead and got hair removal cream, it makes healing of the skin easier if you come off, it also makes putting suncream on much better, smooth legs, well I never. We reach the river Seine and see Barry’s boss in the distance, the time had come, we pull over, it’s scorching there’s no shade, we say our good byes and he’s gone, I feel a sense of loss. We refuel, water/flapjacks mmmm they are nice, thank you to whoever made them. We move on only to get a puncture, it’s been mentioned in the blog, we end the route for day three and start day 4 ten miles done, we call it a day, on the bus and looking for IBIS, where’s that TomTom, the banter between Richard and his dad amuses me no end, I think about my father and what he would have been like on this trip, god help us. IBIS located the ritual starts again, case explodes, gadgets all over my bed, further more I’m now in charge of the blog, this worries me, I hated school, I think to myself CSE grade five English is not going to cut it, I’m panicking, I do worry at times. Early to bed, except i’m putting the blog together, fortunately, I cannot log on, I contact Barry for assistance, I can write it and send it to him, for proof reading, relief. 04.45 alarm call, I start to see a routine taking place that I’m not involved in, Sudacrem is being passed around, fingers in, bib shorts opened at the front and a deep reach around taking place with moans of OOOH THAT’S NICE, I giggle pleased not to be involved although I do use talk to help me. We crack on we seem to be in the market garden of France crops both side of the road, I love a forage for free food, sweet peas in the pod as well, delish. There then starts a peloton, 21 miles per hour, Gary leading the front, I take over periodically to ease the strain, it’s hard breaking through the air at the front, there is moaning and groaning at the rear, but we have to cover some miles today and it’s flat, we press on, we enter a village to find the support crew having a hot brew at some tables out side a cafe, they direct us to the next stop some 10 miles further on, I need that brew, I sense Paul needs it too, but we crack on to my disappointment. We knew today was going to be long, I didn’t realize how long it really was going to be, at our dinner stop, well almost the Garmin decides to throw us a curved ball, sending us down another bridle path, no way through for road bikes, Richard calls the bus, they are at the stop waiting for us, it’s miles away, teddies are being thrown out, poor Gary wasn’t privy to the news that they were only down the road, his Garmin telling us to go a different way, us telling him to ignore it, it all works out fine in the end, we reach the stop, some 90 miles into the ride, before our lunch, it’s about 3 in the afternoon, as we sit down to order, I hear the bar tender telling Mr Williams they had stopped serving food, this isn’t good, but we could fine somewhere else I’m sure, I tell Richard the good news, first mistake, I ducked, the teddy missed me, time for the loo, sharp exit, we are rescued when the bar tender says we can have pizza, teddies back in and we are all happy, photo opportunity and we are off, we travel through a large forest, warning signs for wild boar, brill I hope I see one, we have seen plenty of wildlife on the way, Hares, Deer, buzzard, even a white horse on the hill, chalk horse that is. We eventually arrive at our stop location lidl car park, the support crew have purchased fruit, the nectarines are delightful, oh the nectarines!!!! Ibis is calling TomTom, we have the TomTom, suitcase explodes, gadgets everywhere you get the picture, washing hanging out the windows was a sight to see, you could see which rooms were ours, trying to dry clothes for the next day, I brought an electric heater with me, as Richard had said they struggled to dry clothes on LEJOG, I very nearly brought a sleeping bag, as suggested by Richard, he very nearly had me on that one. 4.45 alarm call, it’s not getting any easier, usual at the van to our next start location. 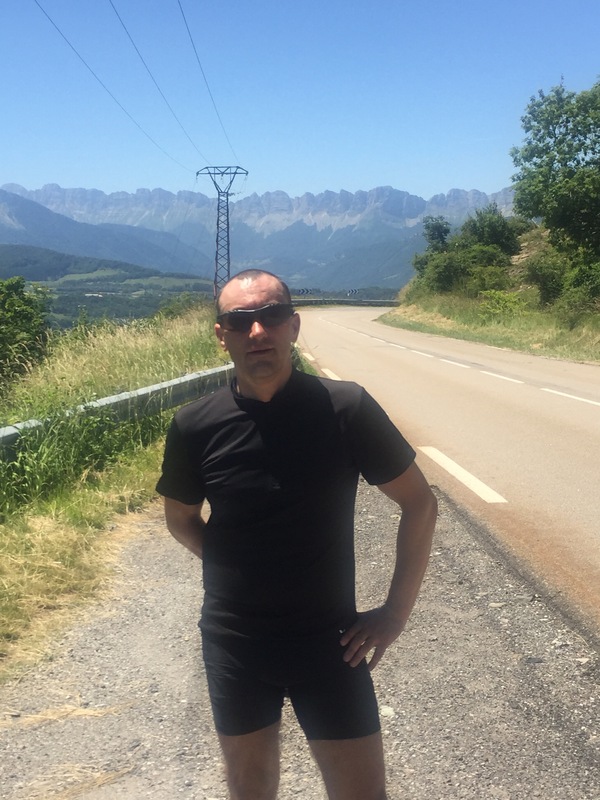 Another big day, I’m getting into it, legs feel great I’m looking forward to the Alps, will I be able to do them, I’ve done enough hills were I live, how hard can it be, I was a bit disappointed that we were not doing a famous climb, but they’ll still be there next year. We climb up and down for miles, just rolling hills with no real reward, head down and grind them out, it’s the only way. I remember this really long road at the end I see a church, high on a hill, the road leads straight for it, I’m with Richard and mike chatting, I see Gary leaving us, that’s it I said, see you at the top, I’m off chasing Gary, it’s a good old slog, starting to breathe hard we make it to the top, support van waiting, I see a cyclist wearing sandals, the sure sign of a long distance rider, possibly Audaxing, French term for a long distance cyclist or Randonneur, I see him get his drinks bottle and disappear into the toilets on the car park, we take some time to recover, the cyclist disappears on his bike, panniers overloaded by the looks of it. Richard says he needs the toilet and will head off, we can catch him up, as he disappears Mike shouts up, aren’t they the toilets, oops never mind. We set off in hot pursuit of Richard, we can see him in the distance, Mike and I set off at a pace only seen in a time trial, I can see Gary out in front, he’s with the cyclist with sandals on, they appear to be racing, I laugh to myself, how funny, I’m looking at my speed and shouting it back to Mike, 35 mph we are sweating but won’t be beaten, we pass the sandals cyclist we acknowledge each other, I didn’t see him again, onwards we eventually catch Richard, it took some doing that’s for sure. 116 miles what a great day, IBIS here we come. 4.45 good morning alarm call, it’s now regimented. I like a good laugh, if I could of got away with it, I would have had the support crew going off their heads with seatbelt indicators wipers and lights going off, I thought I need them more than they need me so reluctantly wound my neck in. I was eating a banana and threw the skin in the bushes, its been documented in the day blog, but was funny seeing Richard do a David Bellamy, (ask your mum) off we go, unbeknown to me, it’s going to be a great day. GARMIN throws us the curved ball again, I’m so glad I’ve not got one, it must be very hard for Gary up front leading the way, me, I’m just looking around taking in the country side not a care in the world, brilliant. Back into the Forest it’s so beautiful, peaceful, I could live here, Mandy needs to come and see this, what a way to see France I think to myself, I continually tell everyone, you could be in work now, it focuses the mind I feel, it makes it all worth while, a reality check of sorts. We stop in beautiful town, the names pass me by, we have breakfast, we even get to choose in the shop, we were very tempted to go across the road for a brew, ooh coffee, I need coffee, it was decided against and we ate at the bus, river running past with its own canoe course brilliant. All stuffed we set off, Gary quickly diverts us from a 20% hill, breakfast wouldn’t have lasted long thats for sure, we circumnavigate it and wind up the first set of S bends , wow I was smiling, Gary at my side we wind our way up, it’s fantastic, just what I had been waiting for, I think it’s fair to say, myself and Gary had been coasting up to this point, i was in my element, pushing on through the trees, grinning from ear to ear, I couldn’t get enough, we finally make the top and patiently wait for the rest, I didn’t mind, it allowed me to push hard and have a recovery period, fantastic, Paul comes around the corner, breathing hard, but he’s up, wow he’s committed. Mike and Richard appear, they continue on, its their way of coping. Onwards and up wards we make 20 miles at the top of the climb, support bus waiting, Richard tells us, it’s 20 miles down hill from here, I found that hard to believe, I though he was joking, we donned jackets to keep the morning chill out and we were off, wow the views were amazing, down we went stopping for photos, we could have stopped every few feet it was amazing. Off we went, sweeping left and right hand bends, no traffic behind us, it was about as near as i can get to reading it in a magazine, only this time it was me, on the bike descending like a pro racer, thats how it felt to me, I was in bike heaven, sun on my back, zooming down, it never stopped it really was amazing, I cannot do it justice on this blog. 20 miles in and we have reached the bottom, wow oh wow. To finish it off, a farmer had set a bird scarer in the field close to the road, bang bang, I swear Richard passed wind, it woke us all up. Great end to a fantastic day. 4.45 alarm call , and so my day had come, the day I thought about since sitting in Starbucks Rhostyllen, the Alps, our fist initial climb was a steady 15 miles nothing to write home about, but when we went over the top, the sight that greeted us was amazing, the french alps, in all their glory, snow on the tops, here it is, have I got what it takes to climb these, we shall see. 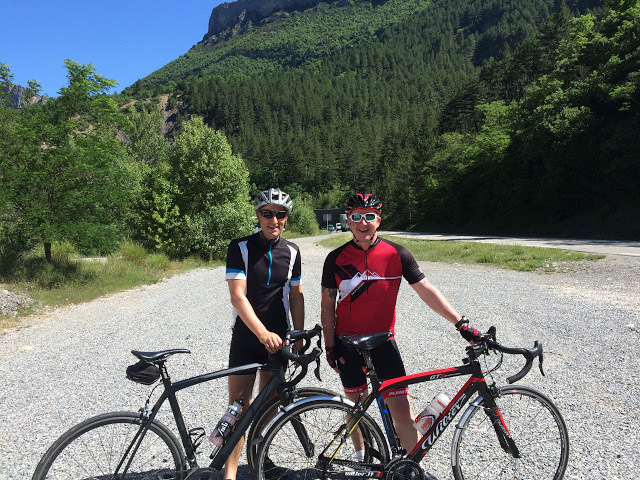 Our decent into Grenoble did not disappoint, I kept telling Richard and Mike, we’ve won the lottery, this is what it feels like to be millionaires, they agreed, it was very clean, cycle lanes and paths, along side trams, it was set up for cyclists without doubt, we head into Grenoble and in the centre Paul gets a puncture, a shard of glass in the tyre, as we all assist, Richard tries to get the glass out with his fingers, I for medical reasons,carry a pen to jot down heart rate and breathing if necessary, I hand him the top, it has a point on, it will get the glass out without injuring his fingers, I think, as quick as a flash, he says and i quote “WHAT DO YOU WANT ME TO DO WITH THAT WRITE A LETTER” not expecting the sarcastic comment I was taken aback, I explained the reason, it was too late the group had engaged with Richard, it was lost on them, it never appeared again. 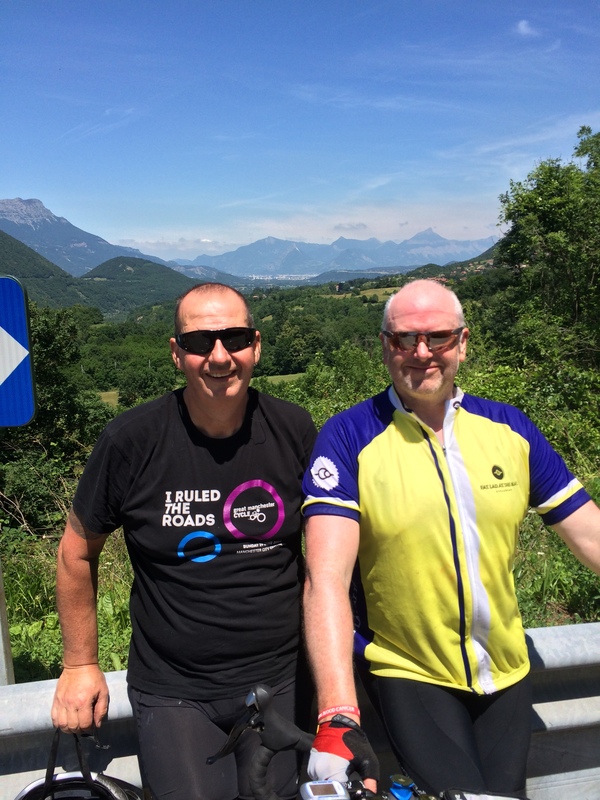 We plod on through Grenoble. its huge it takes us awhile to get through, but we see the signs for Napoleon’s Route, the bus is lost, we crack on the mountains both side of us, its amazing. we head out of town the sun is beating down on us again, I’m not moaning its great. We stop for a comfort break, I see cherries hanging, I don’t need an invite, cherries anyone. A short time later we meet the bus and we are topping our water up, the Alps start now. I give the support crew a brief, if someone looks iffy, stop them riding, including me, I tell every one, no heroes, we’ve got a long way to go, it’s agreed by the group we ride at our own pace, the bus will collect us if we cannot make it. And we are off, its steep for the first 200 meters, then levels into a continuos climb, gaining height against the valley to our right, again it’s fantastic, my self and Gary as riding partners. We reach the top and stop for photos and wait for the rest, more suncream, the group together we set off, climbing then descending it was amazing looking back at the group all inline just like the tour, we stop in a small alpine town for lunch, at the side of the road, I love people watching, it didn’t disappoint, food ordered we wait patiently, we talk of the climb, I’m in climbing heaven, I believe Gary is too, food arrives, Mike some how drops his plate, its smashes on the floor, he makes a grab for his toastie, much to the shock of the waitress, who is trying to get it back, the group fully support Mike again. It is then decided that due to the speed of the group, we would stop at 6 o’clock, the bus would pick us up and we would start off the next day from were we stopped, myself and Gary set off, at a good pace, feeling guilty to leave the group behind, it soon disappeared. The climbs were hard, the downs were just as hard, 12% down hill, pulling on the brakes for the S bends was hurting my forearms, down to the bottom across a bridge and then up we go. After some time we stopped and decided we might make the finish point before 6, or if we need to turn as we had the Garmin, we would wait at the turn, agreed off we went, running out of water early was a worry, it wasn’t going to stop me now, I was gunning it, I could see the top of the pass, Gary was out in front, I told him to just go, but to be fair, he stuck with me. The next thing I know the bus is along side us, the team was back together, we were ten miles ahead of them, wow I thought, I looked at my watch, miles stated 99.84, I said to them, I’m not stopping now, it’s 100 miles on the watch, see you up the road, Bob said first safe place around the corner, thumbs up and we were off, we get 100 just before the corner, Gary states we need more incase it downgrades our mileage, off we go, its up hill, I’m spent I’ve got nothing left, we go around the corner, no bus, I was throwing my teddies out big time, so was Gary, where the hell was the bus, right I thought to myself, I’m going for it, Gary also, we set off again determined to get up this steep hill, we round the next corner to see the team in the road cheering us on, the rest is documented, I felt ill, the heat, no water, the pace it took it’s toll, I was also elated that I’d done it, gave it my all there was nothing left, I’d climbed in the Alps and left nothing behind that day, best day of my cycling career, getting back to the hotel, I was feeling physically sick, once I ate I was fine, until 3 am when I was awoken by the same feeling, it passed and I went back to sleep, what an amazing day. 5.45 alarm call, its the future. 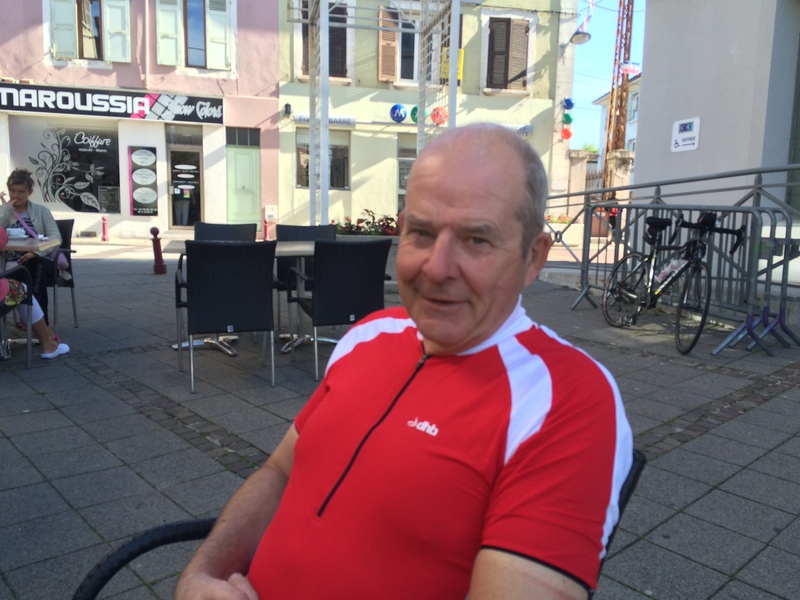 We set off, the high mountains appear to be behind us, we get a good pace on then we stop , the support crew have found a bakery its open, they even do coffee, yes finally coffee for breakfast yay. The baker comes out, Richard is in some sort of conversation with him, at least he can can by, I’m just ignorant having not listened in school, he likes the bikes, mine in particular, well I do have good taste, I might not know the gear size, I just ride it. Off we go 40 miles down hill the pace is set, it’s a brilliant morning, we knew we had another big day, surprisingly I felt really good after yesterdays antics, I was pleased very pleased. We turn off and head in a different direction, we keep going down, stopping at a set of traffic lights, we look to our right, we about to go through a narrow section through the mountains with a river passing below, it was magical, the lights change and we are off, its amazing, we clear the lights and continue for a short time, the bus is on the right we stop, refuel, the river is running uphill, very strange feeling indeed.The climb then beckons, it doesn’t disappoint onwards and upwards sun blazing, it was another amazing pass, an arch way through the mountain, motorbikes passing either way wow, we reach the top, Paul is close by, the views are fantastic, quick recovery and then the best downhill section of the ride, right down into the valley floor were we stop for lunch, I get my laptop out and start typing, I’m behind with the blog. After lunch we climb out of the valley it goes on forever, Gary and myself go off again at a pace, I hear thunder, the clouds are building, I suspect rain, it starts I’ve not got wet gear with me, oh well I’m going to get wet. We press on and reach the top, Garmin says right, sign says left, cafe on the left, thats it we stop and wait for the others, Richard arrives, we look at the mileage 99.something, we all make the 100 superb, however as we descend in the bus, I realize i’ve left my watch on 117 and king of the hills recorded, ah well it wasn’t done on purpose honest. Another great day in the alps. start at 7 am yes yes yes finally the weather is hot already, go pro on and we are off, heading for Nice then along the coast to Monte Carlo, this is it, I do feel emotional, its ending today, we will have succeeded in the challenge, I was excited as well, will we reach Italy another country to tick off. Thanks to Garmin, we head into the airport, bit early as the three leaving us fly later, we find the prom and the sea is there, lovely and blue and people in the water already it’s only 9 am. 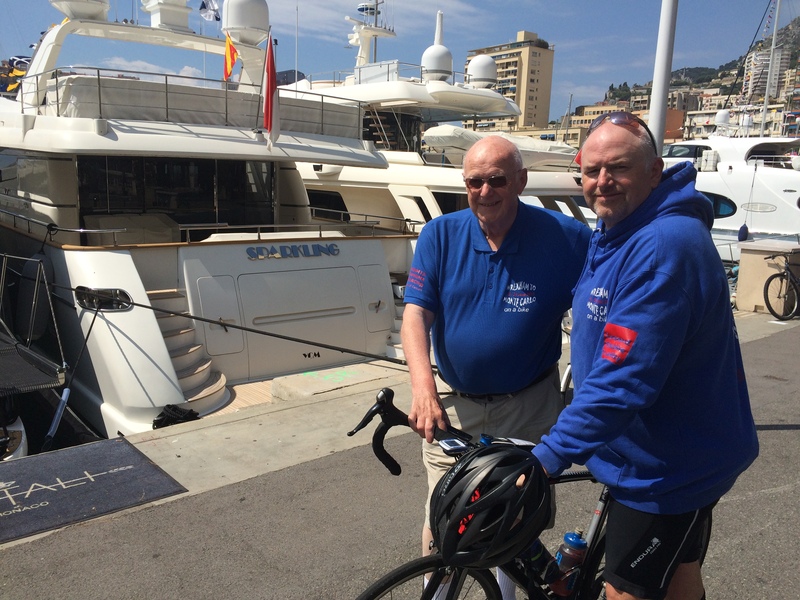 We press on and a short time later having rounded a few headlands we enter Monte Carlo, wow the boats are lined up the sun is shining we are over the moon, We shake hands pat each others backs, the support vehicle is with us, what an experience, beer is ordered and did it taste good. We then look at getting to Italy 18k down the road , it didn’t take long i could see the check point, yes yes yes, we had made it. Well what a ride it was, I have been amazed by the people who rode with me, the support from everyone following back home and a big thank you to everybody who donated to the amazing cause, that kept me going most of all. I have made new friends that will last forever. It has been an amazing experience one I will cherish forever. 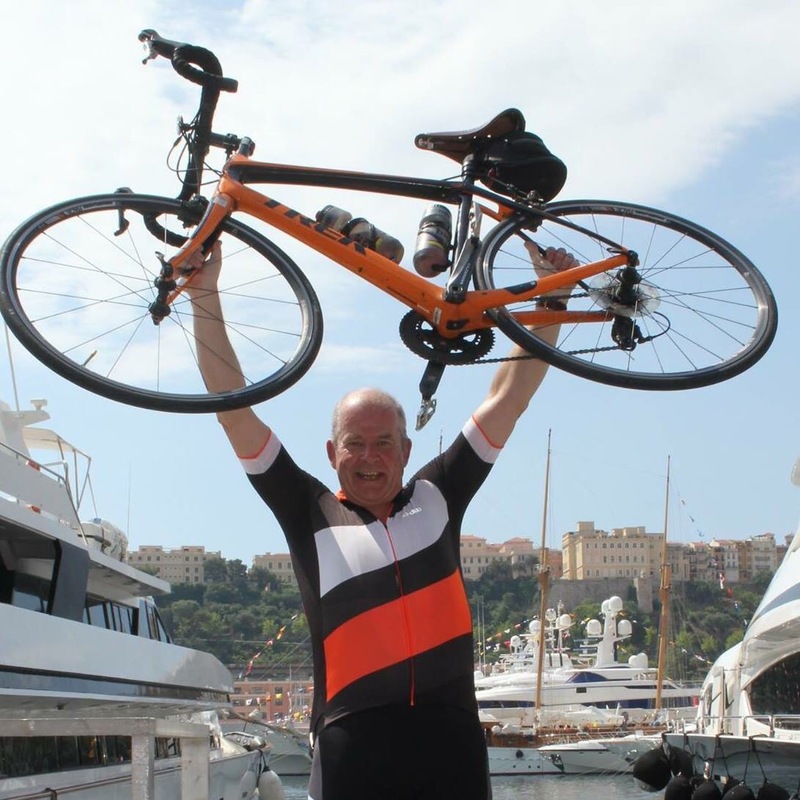 Although I have only been cycling for the last 2 years, I jumped at the chance to get involved with this project – cycle to Monte Carlo…what a challenge! 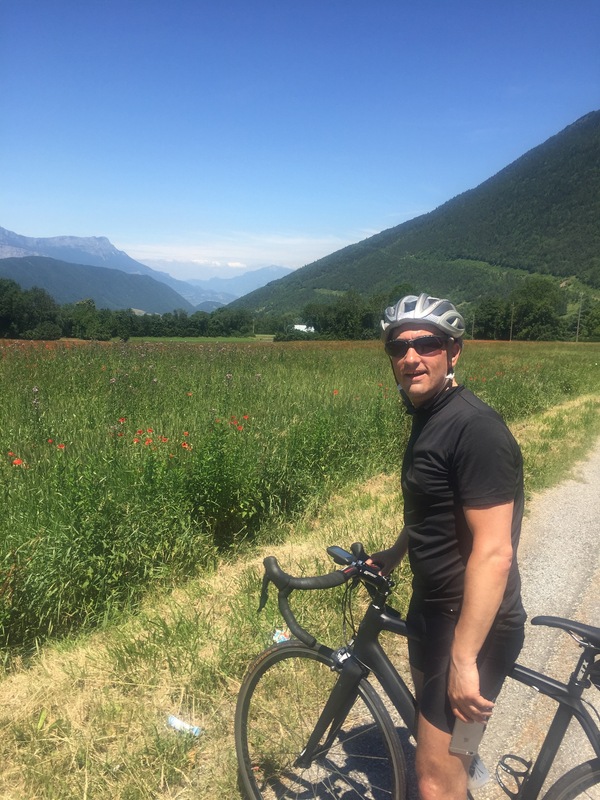 To be completely honest, my initial reason was the cycling, however as the ride developed, I have got as much enjoyment from the fundraising as I have from the cycling. To raise around £10k for 2 excellent charities has given me and the team an enormous amount of satisfaction and has made all the hard work worthwhile. I arrived at Chester Street in Wrexham on Day 1 with a mix of excitement and nervousness. I had no idea what the next 9 days was going to bring, what demands it was going to put on my body, legs and backside in particular! I was pleasantly surprised to see such a great turn out of people to see us all off. A real testament to the amount of support we have all received throughout this process, from during training, to the actual event itself. So, we are ready to go…very professionally, we cycle back up the road so we can do our ride past the waving crowd for photo’s etc. and promptly 2 team members, who shall remain anonymous, fall off their bikes (1 has a good argument that he was “taken out”). You couldn’t write it! So we re-composed ourselves, mainly from the laughter and the 2 casualties brushed themselves down and got back on their bikes! And we were off! The first 2 days in the UK were a mix of hot sunshine and rain…usual UK weather, rain jacket on… rain jacket off… rain jacket on again and so on… but we eventually reached the port to catch the ferry in good time. How we managed to get 4 grown men into that cabin I will never know – apart from the lack of sleep, it was a good thing we only had 3 hours in the cabin before we landed and were straight up and out on the next leg of our adventure in France! Sadly we parted company with Barry after the first day in France as he diverted to his place of work in Paris. 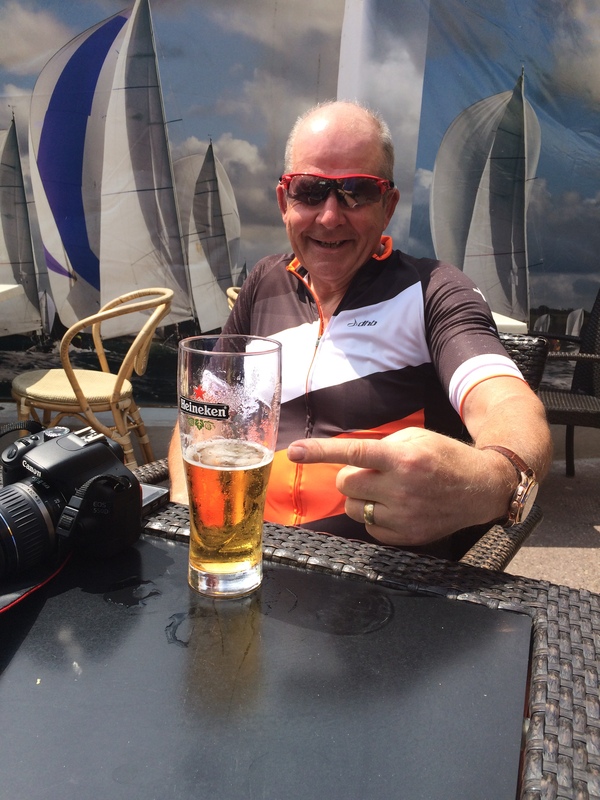 I was definitely going to miss him as the responsibility of the navigation fell firmly onto my shoulders and it was always good to have a second opinion because the planned route pre-loaded on the Garmin had already caused several detours on the first day! 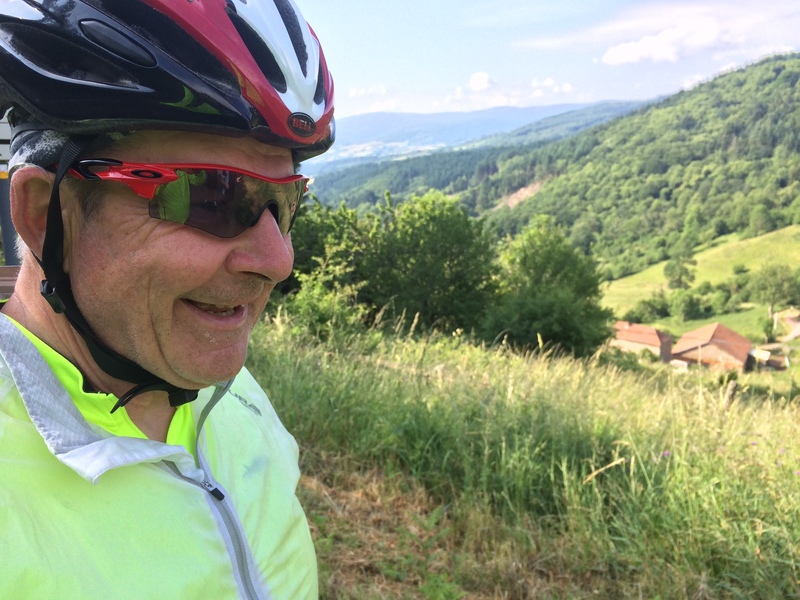 The first 2/3 days in France were long days of cycling through endless farmers crop fields, some of which we stopped and sampled – or deep thick forests. There was no real sign of life in Northern France even the villages were deserted and shops were closed – we even joked about a zombie apocalypse at one point…it was eerie! It was amazing how the body adapted, my main concern over this ride was the ability to ride 100+ miles one day, then to get up the next morning and do it again, and again etc. After 4 days, I felt remarkably well. A few aches for the first 20 minutes on the bike each morning until I loosened up, then I was back in the zone again! Anyway the days flew by in France. 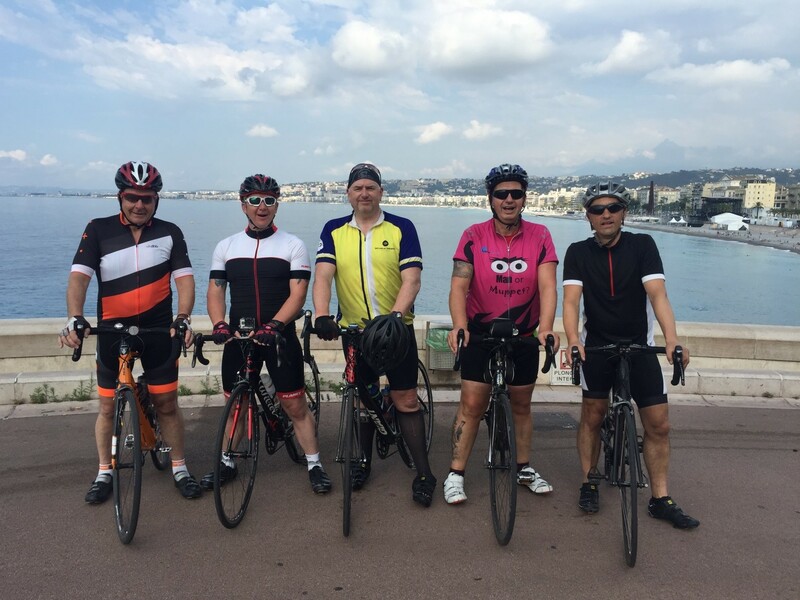 Before we knew it we were through Vichy and Lyon and the Alps loomed large! The last 3 days were by far my favourite part of the journey – the climbs were as I expected, the hairpin bends winding up and up to as much as 4000 feet elevation were the stuff that dreams (or in some cases, nightmares) were made of! We never quite reached the dizzy heights of 50,000 feet as reported in the Leader! J The scenery however was breath-taking! I can’t do it justice by trying to describe it, but I could hardly believe I was actually seeing the sights first hand, it was like something off the TV. Whilst the climbs were tough, the descents were a lot of fun. Credit to the whole team, each of whom battled through their own personal challenges to get up the climbs, it was a credit to all of them! Before we knew it, we were high fiving and congratulating each other…we had arrived in Monte Carlo…what an adventure it had been. Again there was mixed emotions, relief that we had made it to our destination and a little sadness that it was all over! Just for good measure, we decided to cycle into a fifth country so we cycled another 10 miles and crossed the border into Italy to tick another box before we put our bikes into the mini bus for the final time! The whole experience was amazing. It has genuinely been my pleasure to be part of this team – I can honestly say that there were moments when people frustrated me, and no doubt times when I frustrated them, but when all was said and done at the end of the day we got off the bikes, went for something to eat and any tension was forgotten and we had a great laugh. The support vehicle did just that, support us, and for that we were all grateful. Driving ahead to find us food, drink etc. 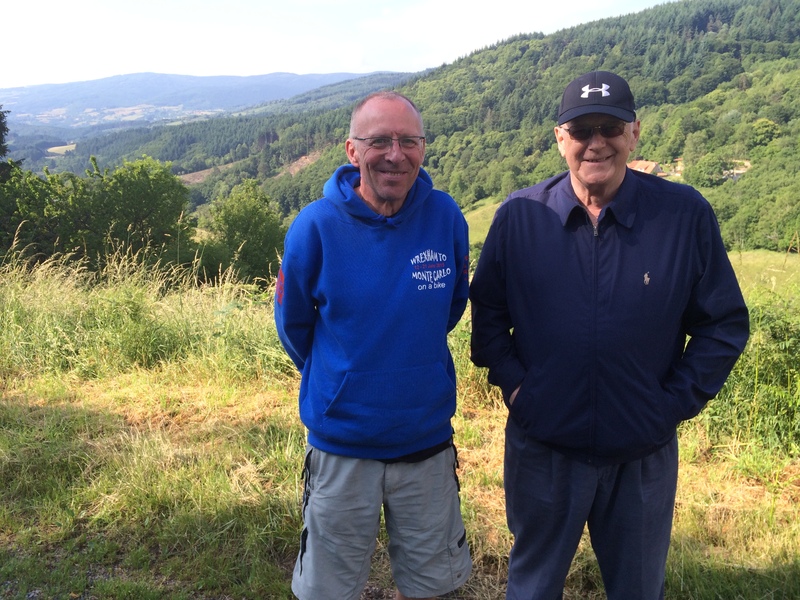 Barry & Bob, we couldn’t have done it without you! Thanks! I don’t want to single out anybody’s individual performance, as everyone did brilliantly, but a special word to my room-mate for the duration of the trip, Paul “Cookie” Cooke. 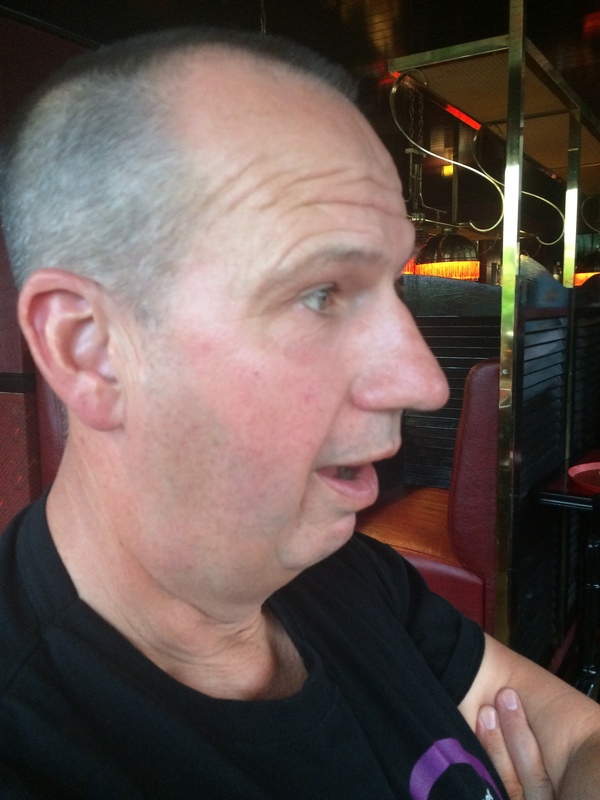 As the most senior member of the team at 62 years young, Paul’s steely determination and sheer bloody mindedness meant that Paul refused to take any easy options – no cutting corners, no stopping to push, no getting in the van early and generally giving all of us a good run for our money. As far as I could see, Paul trained harder than any of us, and all his hard work definitely paid off. So Well done Paul! It was a pleasure to train and ride with you! 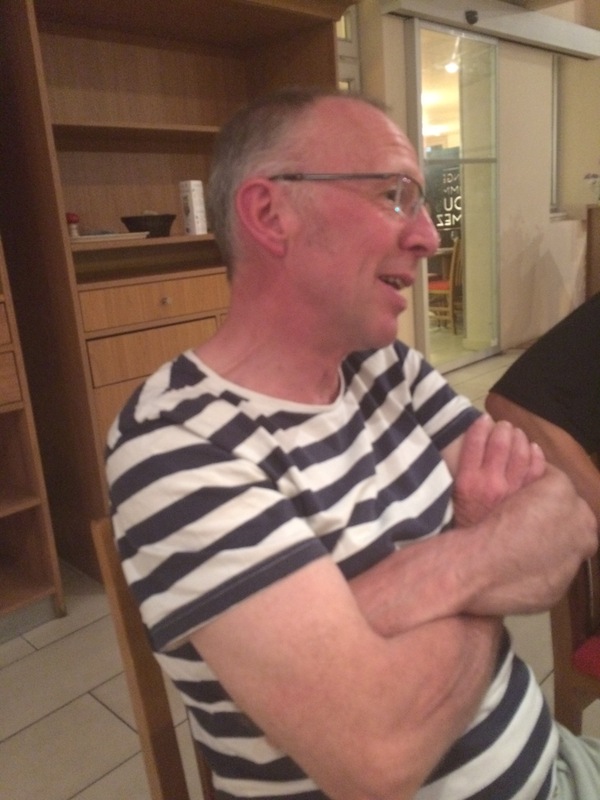 Finally, I can only echo the same question put by Richard in his final blog….WHERE NEXT? When you arrange this sort of event, you never really know what the right mix of people will be. Yes we have cycled together on training rides but spending a week in each other’s company is a different matter. There were times due to tiredness, exhaustion or sheer frustration when I am sure we could have willingly throttled each other, but on the whole the mix was perfect. Nick took a day off work to lead us out for the first half day. He is probably one of the strongest cyclists I know. Nick took us the first 50 miles at a great pace, taking the pressure off the team. 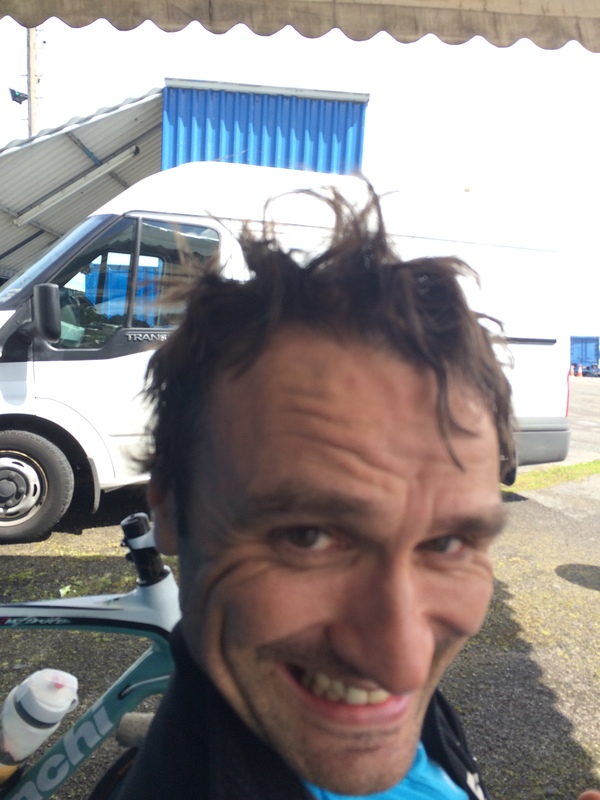 Nick is a very experienced cyclist with a background in road racing. He is one of those cyclists that despite being so much more capable than you, he will sit on your wheel or alongside you and chat as you struggle up a climb or go out front and brake the wind (cycling term). Having Nick with us at the start was just what we needed and set us up for an early finish and a well earned rest. Driver, mechanic and all round Mr Fix It, Bob’s practical abilities were needed on several occasions to change tyres, fix spokes and the odd puncture. Ironically, 1000 miles and we only had 3 punctures! Bobs jaunty attitude and love of an anecdote made him a ideal member of the team. His speech at the last supper was very emotional and I am grateful he gave up his time to help out. 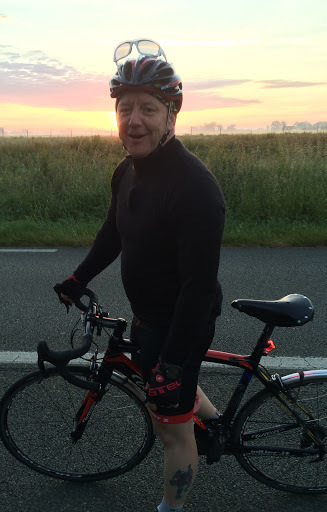 The youngest member of the team, Gary (encouraged by Mike), only started cycling 2 years ago and has already become a superb cyclist, so much so that Mike was overheard saying, “Jesus I’ve created a monster”. 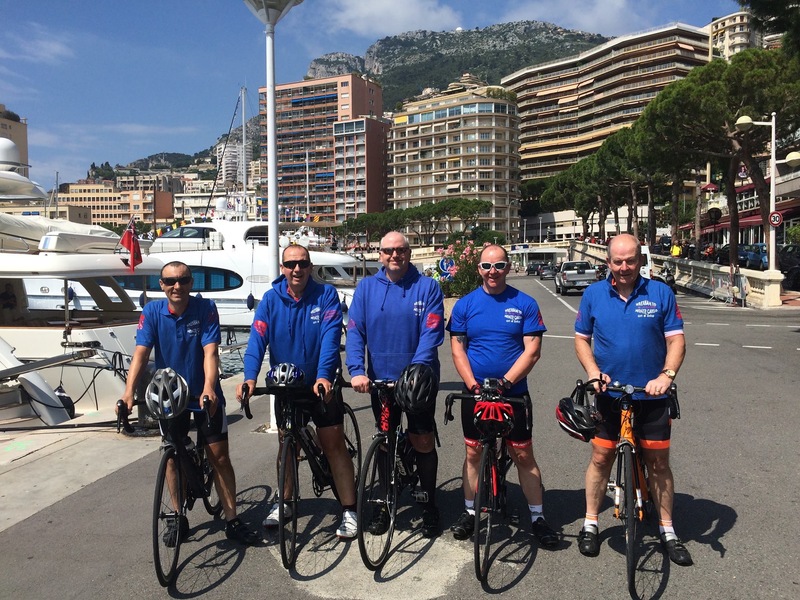 Promoted to Red 1 when Barry turned left for Paris, Gary led the way making sure we stayed on route. I have long since learned what a thankless job Red 1 is. Get lost and everyone complains, go too quickly and everyone moans, get it right and no one says a word. Being responsible for the team whilst managing your own cycling, nutrition and hydration is no mean feet. Gary’s happy demenor and general concern for the welfare of the team made him an ideal leader. Gary we all appreciate your hard work and commitment to the cause thank you. 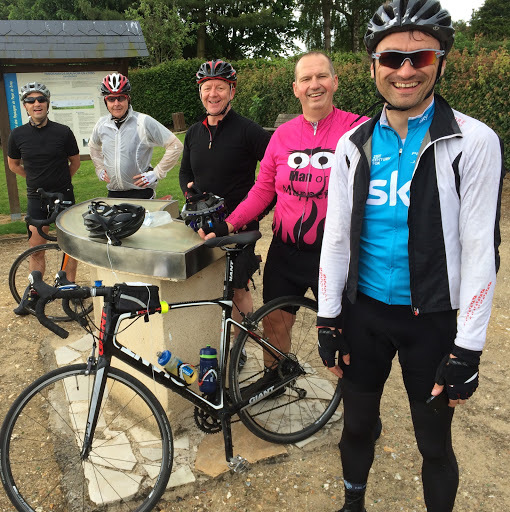 Every cycling group needs a Steve, always there ready and willing to help. His strength meant one minute he could be at the back encouraging us along, the next out front looking for a place to stop or a crop to forage. He settled into the role brilliantly and provided much needed encouragement to the strugglers. Always calm, always consistent, Steve on the outside would have you believe he is the strong silent one but we all know that really there is a naughty boy trying to get out! As the groups First Aider Steve was always on look out for an opportunity to get his First Aid bag out and I was grateful when he patched me up outside Gloucester following an incident with the back of Paul’s bike and a street light. 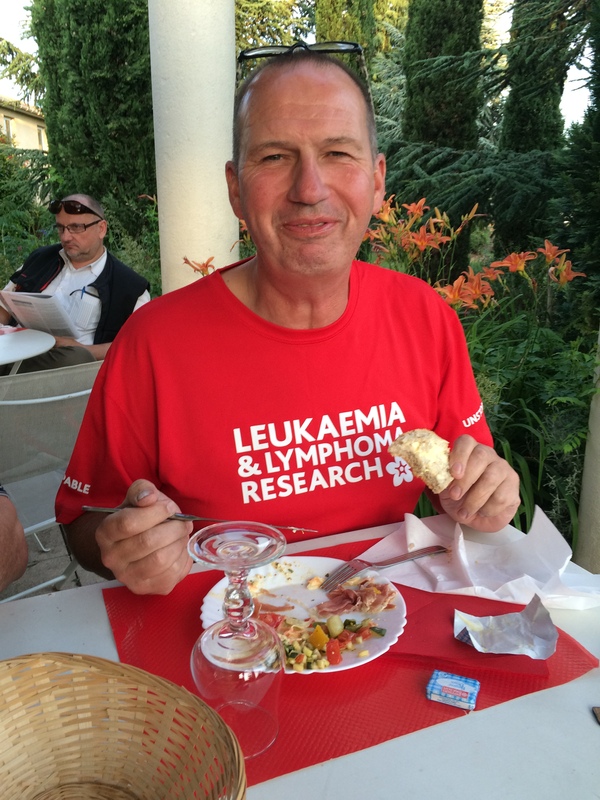 A wonderful sense of humour and a willingness to get stuck in made Steve an invaluable member of the team. When I first discussed the idea of Wrexham to Monte Carlo with Paul his eyes lit up. I had no idea that they would stay like that throughout the whole adventure. To say Paul embraced the challenge would be a huge understatement. He absolutely loved it. As the elder statesmen (cycling), Paul never let that get in the way. Yes he will tell you that it takes a little time to get going but once at full speed he smashed it! Every trip needs its hero, that one person who everyone looks at and thinks my god that is amazing. Paul you are a true hero, your continued determination without a single moan was an inspiration to me and to the others and for that I thank you. I don’t have the words to adequately describe Mike to you. For those of you who know him well you will know that as well as being a great bloke, he also has a steely determination and a never quit attitude. His pursuit of a cup of tea is legendary and I will long remember the joy on his face when in one restaurant they brought him a teapot and then the shear disappointment when he realised they had sent him a collection of fruit teas. On a more serious note, there were times when he could have stopped. In fact every one of us told him to but he wouldn’t. 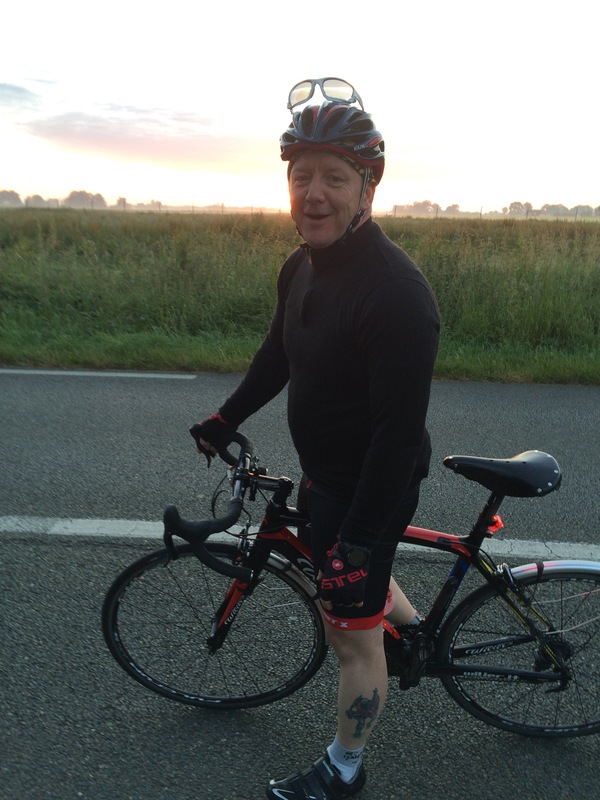 He kept going even when the pain was so bad it made cycling unbearable. It would be remiss of me not to mention the work Mike has done organising all the hotels, the van, the water amongst other things. Despite some mocking (some of the hotels looked like prison blocks), he did a wonderful job and made our lives so much easier. At times we would bicker like an old married couple but Mike and I have shared some great times and some great adventures and you will always be a true friend and a true hero to me. It is not the way Barry encourages or cajoles you on a ride, or even his empathy when you are on a hill, those would be traits of a good leader. Barry is not a good leader, he is a great leader. He has a better understanding of your capability than you do. His ability to set the pace for a group of 5 mixed ability riders based on gradient and conditions is truly amazing. The saddest part of this adventure happened before we started when Barry informed us that he couldn’t do the ride. Mike and I deliberated long and hard as to whether we should continue at all. We are never happier than when we cycle together mercilessly ribbing each other as only good friends can do. We do make the strangest group of mixed ability cyclists and at times people passing must think that Barry is our carer!! We were both delighted when Barry confirmed he could do the Wrexham to Paris section. Barry performed as expected, controlling things as only he can. Sharing a room with them both in Gloucester brought back so many happy memories. At one point that evening Mike set off for reception on a quest for more towels or teabags. As the door slammed shut we both looked at each other and said ‘he did have pants on didn’t he!’ During our last trip, Mike had been back and to to reception in only a shirt and underpants having forgot his trousers! When Barry left us in Paris there was no real sadness, we had long since rationalised that we would go our separate ways. 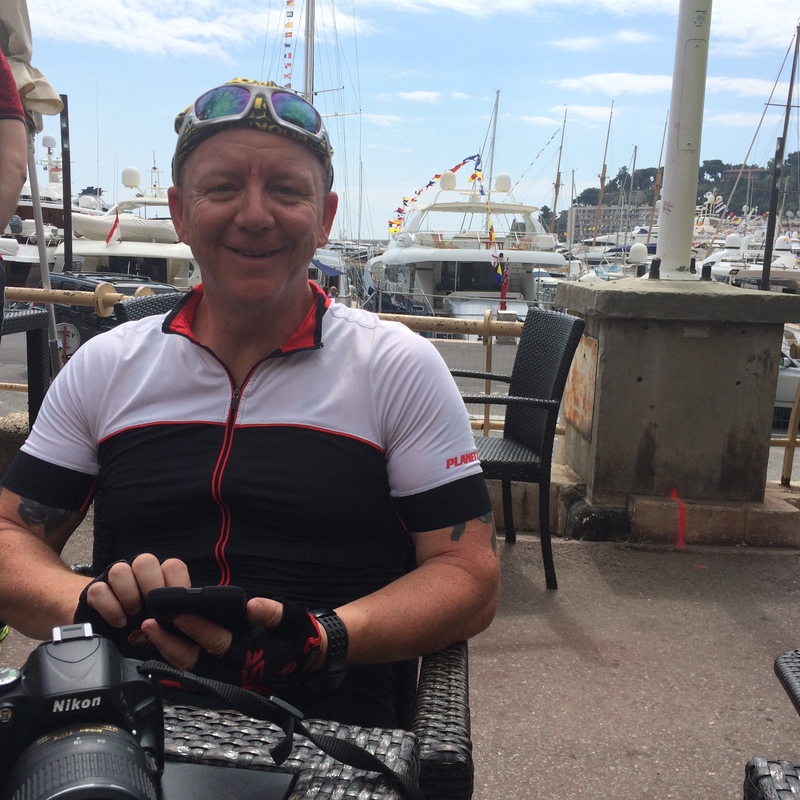 I phoned Barry as we cycled the last kilometre into Monte Carlo and we chatted as we turned the last few corners. It just seemed right that he should share in the experience, he was not with us but still a member of the team. I couldn’t have been happier when dad said he wanted to come along as navigator. After all he has been my greatest inspiration in life. He has also been my biggest critic which helps keep you grounded. After 110 miles one day I commented that I was exhausted he looked at me and suggested that if I couldn’t make it perhaps I should get in the van! No further motivation was required and I finished at 119 miles. I think all of you know dad has suffered within Non-Hodgkin’s lymphoma for many years and he has fought several re-occurrences. I am proud to be able to raise money for a research charity that works to find a cure for an illness that has made him so poorly. I am so lucky that I am able to share these experience with him and so pleased that everyone enjoyed spending time with him. I’m not sure I will miss the ‘where are you’ telephone calls when we were not where he expected us to be. We are all so grateful to you for making this experience such a happy one, for providing the food and even preparing it. If I recall correctly the last time you made me a sandwich was in 1972! I have had messages from the entire team saying how welcome you made them feel. As for me, I would like to thank every one who has supported us during this challenge. To our long suffering wives and girlfriends who listened intently to our moans and offered encouragement on a daily basis. We are also grateful to Nia who helped so much with the arrangements and for also running base camp whilst we were away. The sponsorship and words of encouragement have made such a difference, it is amazing how one small text message with a few words of encouragement can mean so much when things get tough. I will always cherish the memories of this week and the time we shared cycling together. Just one question, where next?